This story starts up on Exmoor some time ago. We were walking beside Oare Water when we saw a family of mallard ducks – a mother and her offspring. She was leading the ducklings upstream and it was great fun watching them as they scrabbled up the rocks. Not surprisingly, I took some photographs of them (which you can see if you follow the link at the bottom of this blog). However, it would have made a superb little sequence had it been on video. So, yesterday morning we actually set off on a duck hunt – where on the rivers flowing south of Dartmoor would I find those sort of condition and, of course, some ducks? As we drove up onto the moor we came across something that is somewhat unusual on Dartmoor: a peacock lying across the lane. There are peacocks at The Hunters’ Inn at Trentishoe and there used to be some at a house called Moorgate beside Peek Moor Gate on the south east slopes of Ugborough Beacon where we often took the dogs for walks some twenty years ago but lying in the middle of the road on Dartmoor? Here is the proof. 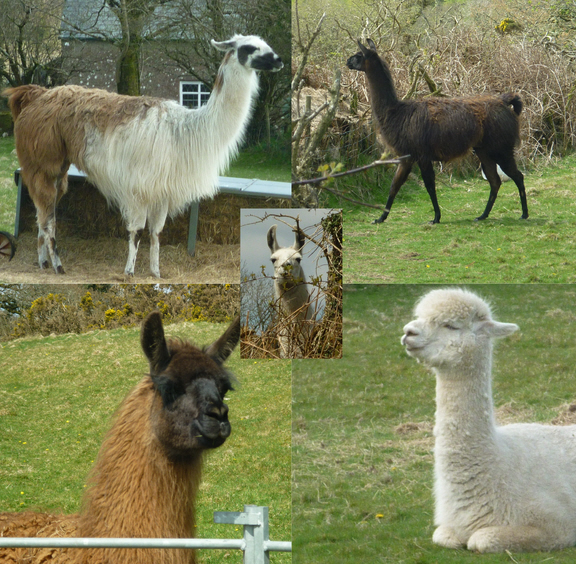 Shortly after that, there in a field beside the lane was something else that is unusual on the moor: a small herd of alpacas. Yes, I know that they are becoming quite popular but they are not the norm here. Nor are little clusters of daffodils growing in the open like these. Nor are Polling Stations such as this one in the village hall at Leusdon (but, to be fair, it was polling day yesterday). Anyway, I decided that four unusual things were quite enough to warrant the heading for this blog. Spring has finally arrived. Yellow flowers everywhere, . . .
a few white ones . . . 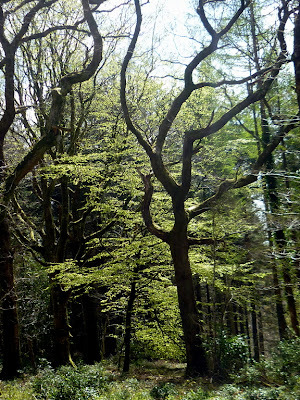 It was wonderful to see a beech in leaf near the lane that winds down from Buckland-in-the-Moor (to avoid confusion with Buckland Monachorum to the west of Tavistock) beside the delightfully named Mistresses Piece and so towards the confluence of the River Webburn and the River Dart at Buckland Bridge. Here we saw some dippers years ago and I hope to see them again soon but, sadly, no ducks. Names are fascinating. Why “Mistresses Piece”? I have no idea. Googling the name doesn’t help and can, as you would expect, lead you to places best ignored. Next was Salters Pool near New Bridge where we saw a couple of mallard a week or so ago busy diving for food. This time the pool was covered in water lilies (it will look wonderful soon – I will post a picture when they are in flower) and the water was a dirty green which I assume this was caused by a bloom of algae but today there was not one in sight. Then it was home by way of the River Harbourne – also duckless. Not a successful day, but a wonderful one despite that. The blog dog this week is Barak – a very refined and self-contained gentleman. Click here to see the mallard family on Exmoor.